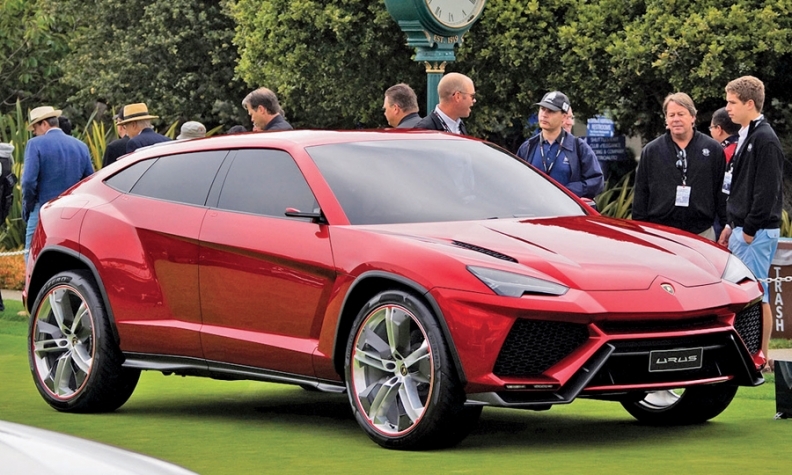 Lamborghini previewed its new SUV with the Urus concept, shown in Pebble Beach, California. MILAN (Reuters) -- Lamborghini will produce its new SUV at its Sant'Agata Bolognese plant in Italy, with the model due to enter the market in 2018, the company said today. Lamborghini said it will hire 500 new employees, almost double the physical size of its plant in Italy's Emilia Romagna region and invest "hundreds of millions of euros" in the project over the life cycle of the vehicle. Lamborghini, part of the Volkswagen group, hopes the SUV will allow it to repeat sister brand Porsche's success in the fast-growing market for luxury SUVs and boost profitability. The SUV's targeted annual volumes of around 3,000 vehicles will more than double the company's deliveries, which stood at 2,530 vehicles last year. The model is expected to cost 180,000 euros ($196,000). "The introduction of a third model signifies for us the beginning of a new era," Lamborghini CEO Stephan Winkelmann said in a statement. Winkelmann and Italy's Prime Minister Matteo Renzi met in Rome today to sign a letter of intent for Italian production of the SUV. A source told Reuters on Tuesday that Italy's government provided tax breaks and incentives for a total of up to 90 million euros ($98 million) to encourage Lamborghini to base the production of the new model in the country. With the SUV, Lamborghini will mainly target SUV customers in markets such as the United States, China, the Middle East, the UK, Germany and Russia. The carmaker also hopes to expand its customer base to families and other clients new to the high-performance supercar brand. Lamborghini gave no technical details of the SUV. When it unveiled the Urus at the Beijing auto show in 2012, the company said the production version would target an output of 600 horsepower. It would use lightweight materials for its structure and body shell to offer the best fuel economy and lowest CO2 emissions figure of all comparable vehicles, Lamborghini said, with widespread use of carbon-fiber reinforced plastics, including the seats. Reports at the time said the SUV likely would use an upgraded 552-hp V10 gasoline unit powering the brand's Gallardo. The SUV will share a VW Group platform with the Porsche Cayenne, the Audi Q7, Volkswagen Touareg and Bentley Bentayga. Fears were raised in Italy that the Lamborghini SUV could be built in VW's Slovakia plant, which builds the Q7 and Touareg, as well as bodies-in-white for the Cayenne. The factory will build body shells for the Bentayga for final assembly at the brand's plant in Crewe, England. Lamborghini's decision to base the model in Italy follows a similar move by Fiat Chrysler, which began producing its new Jeep Renegade and Fiat 500X models at a plant in southern Italy last year, also boosting employment. Both companies are helped by labor reform that was approved by Renzi's government earlier this year. In a bid to tackle chronically high unemployment, the reform has eased firing restrictions in large firms and offers fiscal incentives to employers that offer workers permanent contracts.